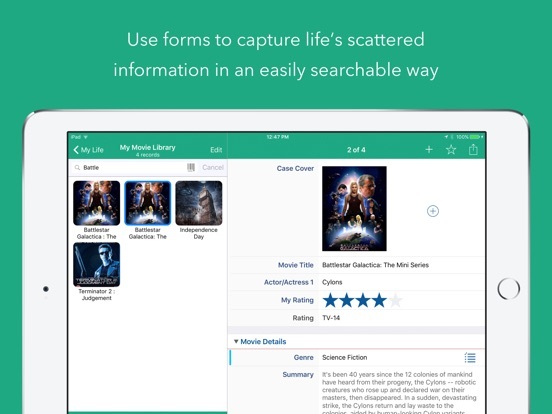 Tap Forms 5 is the digital filing cabinet for life’s scattered details. Now with Scripting and Siri Shortcuts support! Accounts, recipes, expenses, inventory — life is full of things that we don’t want to forget or misplace. 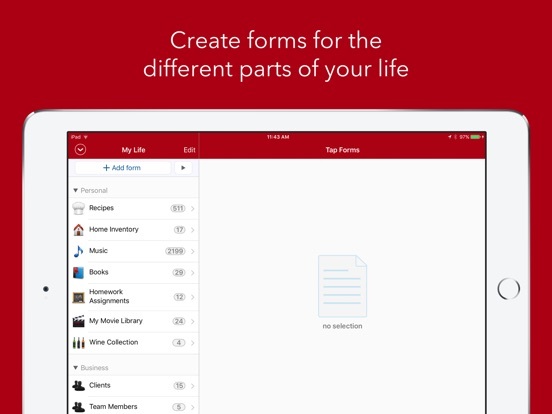 Tap Forms 5 helps you organize all kinds of things in one place — secure, searchable, and accessible on your iPhone, iPad, and Apple Watch (Mac app sold separately). How can one app organize everything? Because not only can you use and customize the more than 30 built-in templates but you can create your own “forms” for inputting any kind of information, even if that information includes pictures, doodles, audio recordings, calculations, file attachments, ratings, or even links to other forms. 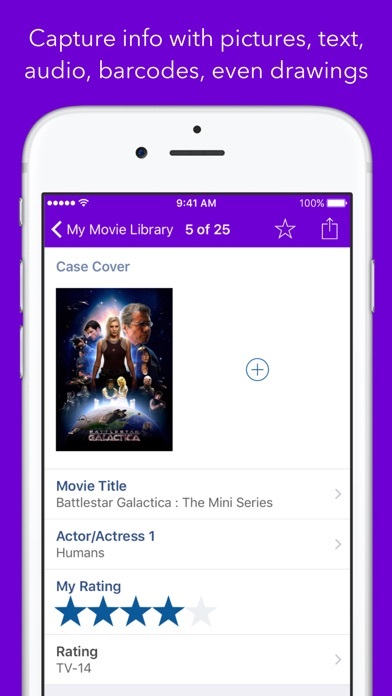 This makes it almost like building your very own customized organization app. 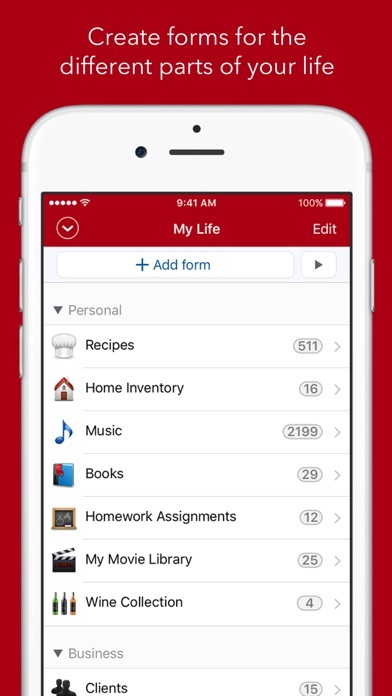 • Organize your way: Create and design custom forms exactly how you want to for optimal organization. Get started with one of our ready-to-go form templates, or easily make a custom one from scratch with our integrated form building tools. 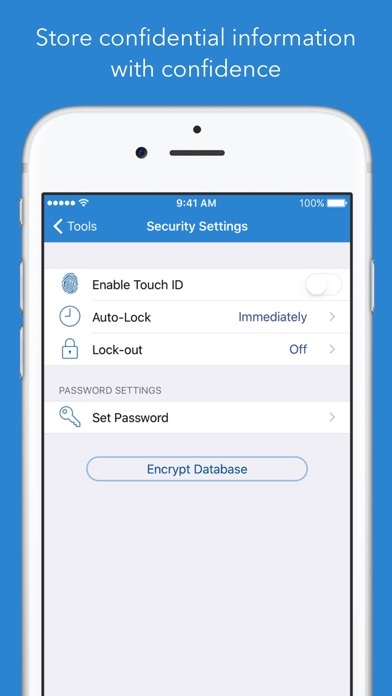 • Store confidential data with confidence: Tap Forms' security settings let you optionally require a password or a Touch ID scan, and even auto-lock when idle for a custom period of time. Using AES encryption, you can rest easy knowing your data is safe and secure. • Import, Export, Share: It’s easy to import your data from existing files, so getting started is a breeze. Import your data from text, CSV, Bento and more. One-tap exporting allows you to share with Mac, Windows, and Linux users. • Siri Shortcuts let you record a voice command to execute any Form script. • Multi-column (table) view of your records. 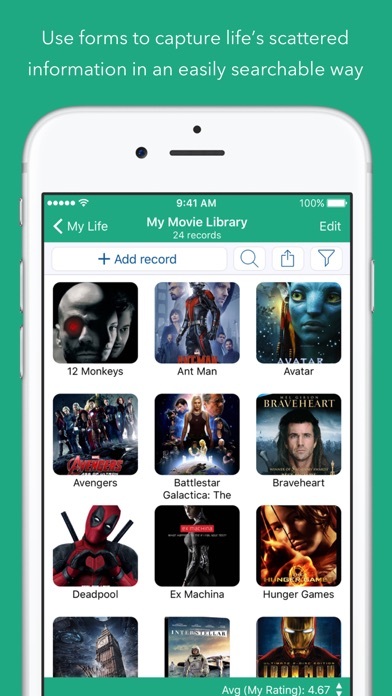 • AirDrop records to your nearby contacts. 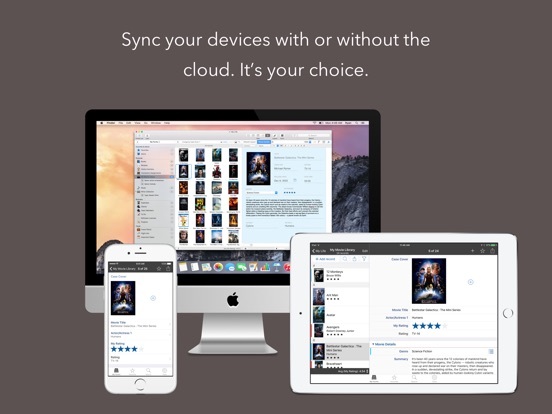 • Sync with Tap Forms for iOS and Mac using iCloud, IBM Cloudant, Nearby (WiFi), or with your own Apache CouchDB sync server. • 1Password Extension integration for logging into your Cloudant sync account. 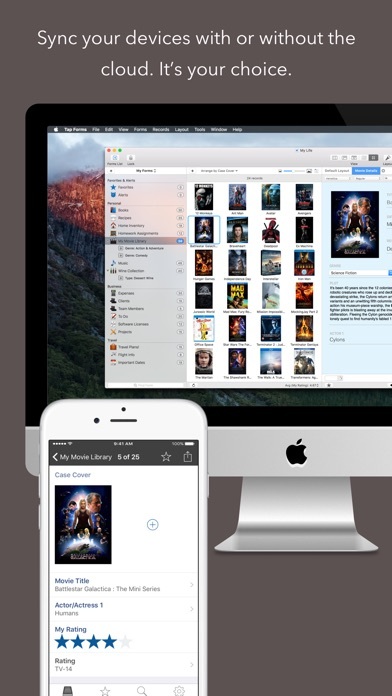 • Document Picker support for accessing iCloud and other document service providers. • Added Plain Text Note option to the Note field to allow Note fields to be used just for plain text only rather than rich text only. 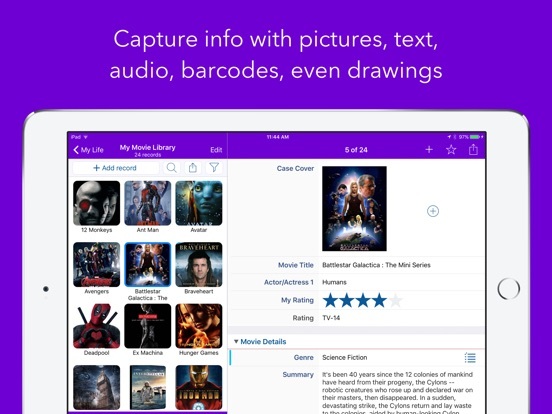 • Fix for QR codes not being recognized when scanning on iPad. • Fixed bug where clearing the selected search would select the last selected record. • Fixed bug where clearing the search term on the multi-column list view would not scroll the last selected row into view. • Fixed theme colour bug with the toolbar on the Backup & Restore screen. • Fixed duplicate form bug where it was duplicating the scripts too many times. • Displaying the select scripts view from the record details screen will now properly pass the selected record to it. • Fixed bug that did not export Pick Lists attached to Table sub-fields when exporting a Tap Forms Archive. • Fixed issue with record being selected on iPhone when swipe to delete. • Fixed bug unlinking many-to-many links. They were being deleted instead of unlinked. • Fixed bug where Tap Forms wasn't asking you for the password if you were viewing a file attachment and then quit and re-opened Tap Forms. Other Apps by Tap Zapp Software Inc.